Easy Peanut Butter Chocolate Chip Cookies are the best of both worlds: peanut butter cookies mixed with chocolate chip cookies! They’re soft and chewy and everyone loves them. Note: these cookies are ADDICTING. You’ve been warned. These aren’t simply peanut butter cookies with chocolate chips; no, they’re chocolate chip cookies with peanut butter. Boom – drop the mic. After I made my favorite peanut butter cookie recipe and the best ever chocolate chip cookie recipe, I started realizing y’all love BOTH of those cookies. Why not make them into one fabulous rich and delicious blended cookie? 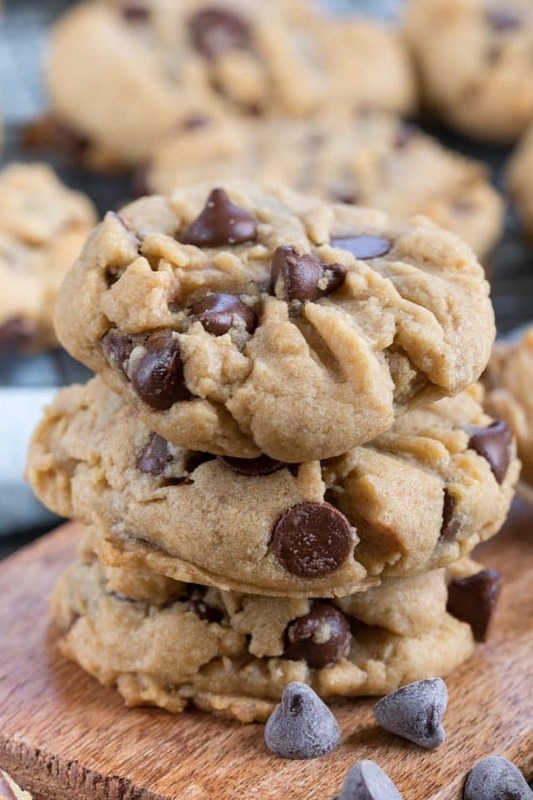 These easy Peanut Butter Chocolate Chip Cookies are chewy and soft, gooey and amazing. 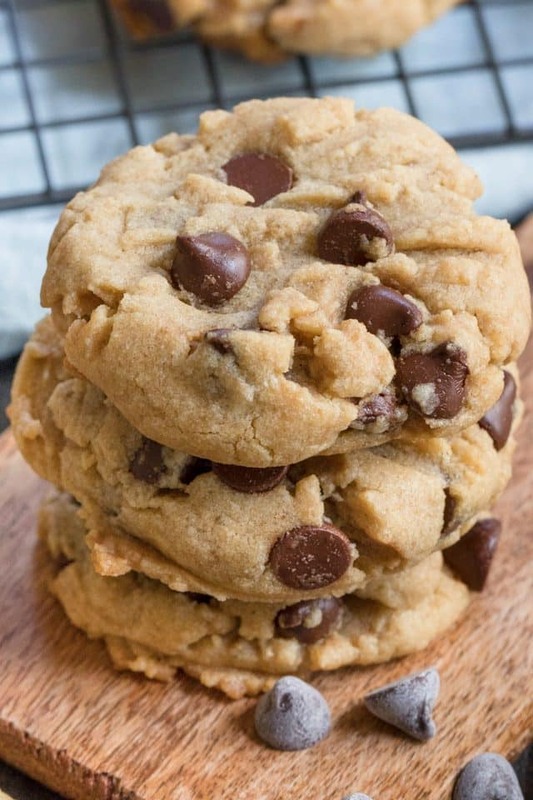 This is the ULTIMATE peanut butter chocolate chip cookie recipe! Now, it’s not just as simple as taking my chocolate chip cookie recipe and adding peanut butter. There were some other structural changes that had to be made as well to make sure to account for the extra fat and volume the peanut butter adds to the cookies. 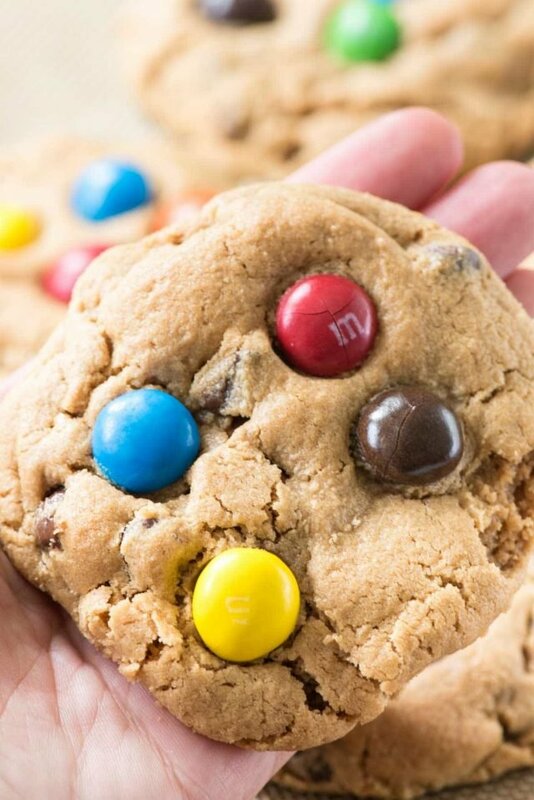 How do you make the perfect peanut butter chocolate chip cookies? Butter – as with my chocolate chip cookie recipe, I start with melted butter. I find that melted butter makes a chocolate chip cookie have so much more depth of flavor, plus it’s easier to mix up because you can do it by hand. Granulated sugar and brown sugar – this recipe has both, as all good cookie recipes do. But I increased the amount of brown sugar in this cookie to add more chew and softness. Brown sugar also gives so much more flavor to a cookie than granulated. 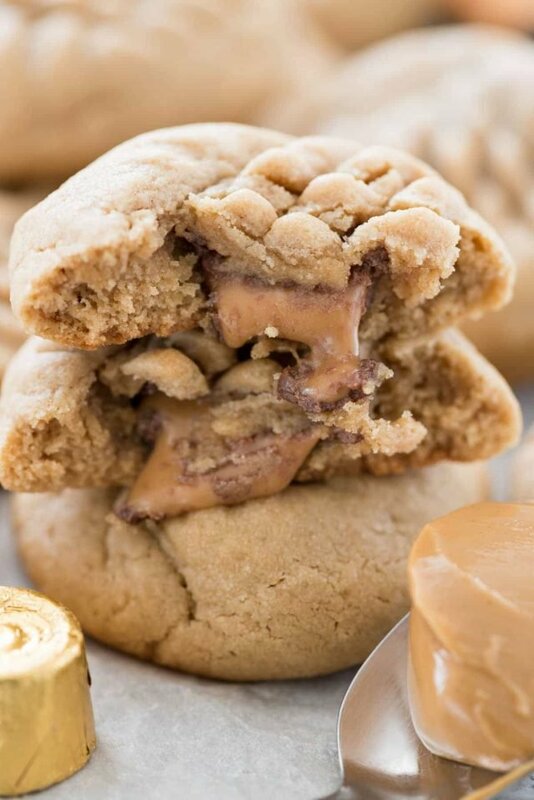 Peanut Butter – to turn a chocolate chip cookie into a peanut butter cookie you have to add peanut butter. 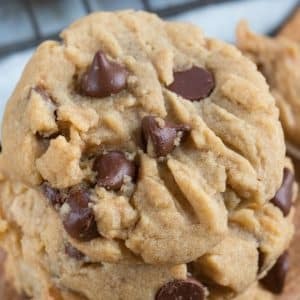 I didn’t use as much as my normal peanut butter cookie recipe because I wanted the texture to be more like a chocolate chip cookie than a soft peanut butter cookie. I used 1/2 cup creamy peanut butter – be sure not to use one you have to stir. I use Skippy or Jif Naturals usually (it’s a more natural version of regular peanut butter but is no-stir). Flour – because of the extra peanut butter and sugar, we have to add a bit more flour to this recipe. I used 1 3/4 cups all-purpose flour and it gave the perfect texture. Do you have to chill cookies before baking? Not always, but these you do. Normally, peanut butter cookies don’t need chilling. However, because these start with melted butter it’s always a good idea to give them a quick chill so they don’t spread too much. I like a gooey, puffy, soft and chewy cookie recipe, so chilling ensures that these cookies will end up with that texture. If you like thinner cookies, you can bake these without chilling. Before baking you need to press these down with the tines of a fork, like you would peanut butter cookies, especially if you’ve chilled them. They won’t spread much at all if they’re cold. Note about chocolate chips: I love using Trader Joe’s chocolate chips. They stay melty!! 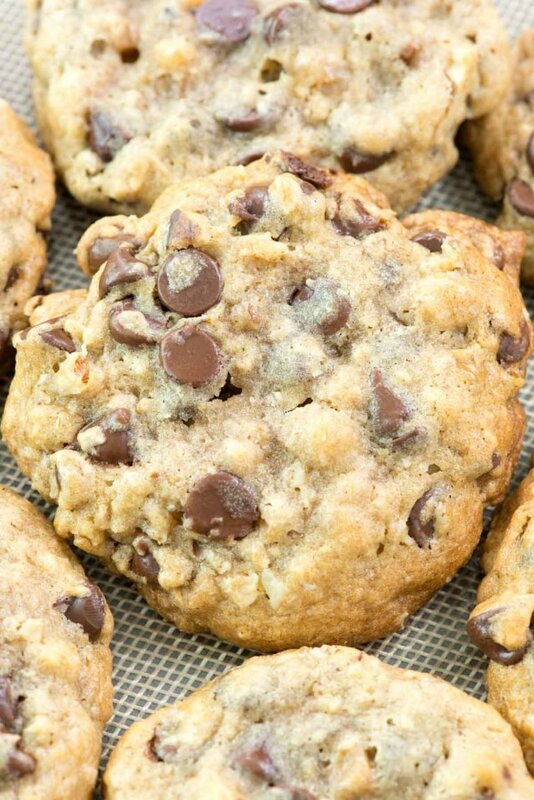 Peanut butter chocolate chip cookies are the perfect basic and easy cookie recipe. It’s such a timeless classic cookie everyone loves! Peanut Butter Chocolate Chip Cookies are the best of both worlds: peanut butter cookies mixed with chocolate chip cookies! Mix or stir butter with peanut butter until smooth. Add brown sugar and granulated sugar and mix until creamy. Beat in vanilla, egg, baking soda, and salt. Mix in flour slowly until cookie dough forms. Stir in chocolate chips. Scoop 2 tablespoon sized cookie dough balls onto cookie sheets covered with parchment paper or silicone baking mats. Chill 30 minutes. Press cookie dough balls flat with the tines of a fork. Bake cookies for 8-12 minutes, or until slightly brown on the bottom and the top just loses the wet cookie dough look. Can’t wait to try these! Looks sooo good! Made these yesterday, AWSOME!. My husband Not a chocolate chip cookie guy( what’s wrong with him) ate 3 in a couple of minutes. Will be making these again soon, Thanks! The cookies were wonderful. I did change to milk chocolate chips. My hubby said it was like a Reese’s peanut butter cup in cookie form. Definitely a recipe I will keep!! OMG!!! I made these today and let me tell you, this is a winner! Not too sweet and loaded wIth chocolate chips (I used dark chocolate, my weakness) and my honey and I could probably eat half of them tonight with some cold milk!! Keep these recipes coming! Can you freeze the dough in a container and bake the cookies later?? It was not too bad but not too good. It tasted awesome but for some odd reason the cookies didnt want to spred out or flatten. the batter was also very crumbly. It tasted really good though! Doubled the recipe and they were gone in just a couple days (even the ones I hid in the freezer). This is a keeper!